You probably all know Waldo, the man with the iconic red and white striped shirt that is sometimes nearly impossible to find on a double-page spread of children&apos;s picture books. I would look over every square inch of the pages of those books when I was younger; trying to find that man who was always located in the very last place I looked. But all of that searching was worth it for the feeling of accomplishment once he was spotted. 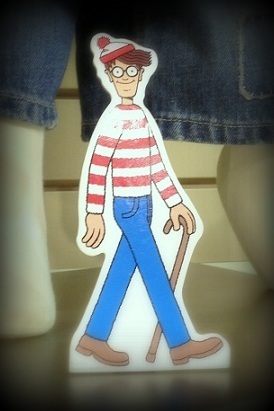 Now Waldo has jumped off of the page and is now hiding in 25 different locations in Rockford! Wonderland Books & Toys is sponsoring a contest that last throughout the month of July where everyone can visit local attractions and businesses to find the clever character. All you have to do is pick up a free "Find Waldo in Rockford!" passport at Wonderland and have each location stamp it once you find the Waldo. All of the locations Waldo is hiding are listed on the passport, so you just have to go to the locations and search away! If you are one of the first 100 people to find 10 Waldos, you can return the passport to Wonderland to collect some prizes. The prizes range from stickers, book coupons, and if you collect 20 stamps you are entered into the grand prize drawing to win a 6-volume deluxe set of Waldo books! Last weekend I just happened to be at a local attraction (I&apos;m not saying which...you have to find it yourself!) and I found one Waldo! I was glad that he&apos;s a little bigger than he is on the page (he stands about 6 inches tall). After seeing him, I&apos;m tempted to go around to the other locations to find more! This is the perfect summer activity to do with people of any age: search for Waldo, and enjoy the attractions and businesses while you&apos;re looking! Wonderland Books & Toys is located in the Edgebrook Center at 1625 North Alpine Road in Rockford. Click here to visit their Facebook page.